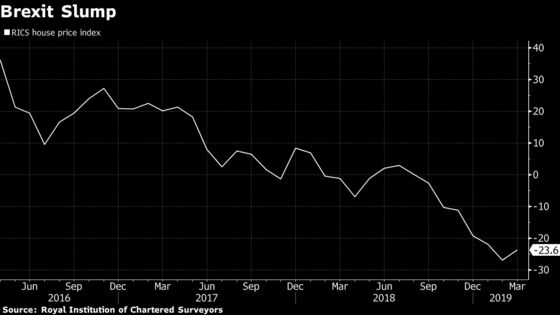 (Bloomberg) -- The Brexit gloom hanging over the U.K. property market showed no signs of letting up in March, with real-estate agents expecting house prices in London and southeast England to continue falling for another year. Britain’s tortured departure from the European Union was widely cited in the latest survey from the Royal Institution of Chartered Surveyors, which painted a picture of anxious buyers, reluctant sellers and agents struggling to negotiate agreements. Demand and supply declined, the report published Thursday found, and an index of prices remained deep in negative territory -- pointing to “modest” losses over the next two quarters. A subsequent recovery is expected to elude London and the southeast, where the market is in its worst slump since the financial crisis. With Prime Minister Theresa May unable to win a parliamentary majority for her Brexit deal, the EU has offered Britain a delay to its departure from the bloc until the end of October. The new deadline risks months more of uncertainty for businesses and consumers.